As Barack Obama's candidacy comes under increasing scrutiny, his account of his religious upbringing deserves careful attention for what it tells us about the candidate's integrity. Obama asserted in December, "I've always been a Christian," and he has adamantly denied ever having been a Muslim. "The only connection I've had to Islam is that my grandfather on my father's side came from that country [Kenya]. But I've never practiced Islam." In February, he claimed: "I have never been a Muslim. … other than my name and the fact that I lived in a populous Muslim country for 4 years when I was a child [Indonesia, 1967-71] I have very little connection to the Islamic religion." "Always" and "never" leave little room for equivocation. But many biographical facts, culled mainly from the American press, suggest that, when growing up, the Democratic candidate for president both saw himself and was seen as a Muslim. Obama's Kenyan birth father: In Islam, religion passes from the father to the child. Barack Hussein Obama, Sr. (1936–1982) was raised a Muslim and named his boy Barack Hussein Obama, Jr. Only Muslim children are named "Hussein". Obama's Indonesian family: His stepfather, Lolo Soetoro, was also a Muslim. In fact, as Obama's half-sister, Maya Soetoro-Ng explained to Jodi Kantor of the New York Times: "My whole family was Muslim, and most of the people I knew were Muslim." An Indonesian publication, the Banjarmasin Post reports a former classmate, Rony Amir, recalling that "All the relatives of Barry's father were very devout Muslims." 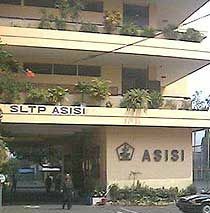 Asisi, Obama's Catholic school in Jakarta. The Catholic school: Nedra Pickler of the Associated Press reports that "documents showed he enrolled as a Muslim" while at a Catholic school during first through third grades. Kim Barker of the Chicago Tribune confirms that Obama was "listed as a Muslim on the registration form for the Catholic school." A blogger who goes by "An American Expat in Southeast Asia" found that "Barack Hussein Obama was registered under the name 'Barry Soetoro' serial number 203 and entered the Franciscan Asisi Primary School on 1 January 1968 and sat in class 1B. … Barry's religion was listed as Islam." The public school: Paul Watson of the Los Angeles Times learned from Indonesians familiar with Obama when he lived in Jakarta that he "was registered by his family as a Muslim at both schools he attended." Haroon Siddiqui of the Toronto Star visited Besuki, the Jakarta public school Obama attended, and found that "Three of his teachers have said he was enrolled as a Muslim." Although Siddiqui cautions that "With the school records missing, eaten by bugs, one has to rely on people's shifting memories," he cites only one retired teacher, Tine Hahiyari, retracting her earlier certainty about Obama's being registered as a Muslim. 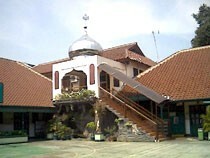 Besuki, Obama's public school in Jakarta. Koran class: In his autobiography, Dreams of My Father, Obama relates how he got into trouble because he "made faces during Koranic studies," thereby revealing he was a Muslim, for Indonesian students in his day attended religious classes according to their faith. Indeed, Obama still retains knowledge from that class: Nicholas D. Kristof of the New York Times, reports that Obama "recalled the opening lines of the Arabic call to prayer, reciting them [to Kristof] with a first-rate accent." Mosque attendance: Obama's half-sister recalled that the family attended the mosque "for big communal events." Watson learned from childhood friends that "Obama sometimes went to Friday prayers at the local mosque." Barker found that "Obama occasionally followed his stepfather to the mosque for Friday prayers." One Indonesia friend, Zulfin Adi, states that Obama "was Muslim. He went to the mosque. I remember him wearing a sarong" (a garment associated with Muslims). Piety: Obama himself says that while living in Indonesia, a Muslim country, he "didn't practice [Islam]," implicitly acknowledging a Muslim identity. Indonesians differ in their memories of him. One, Rony Amir, describes Obama as "previously quite religious in Islam." Obama's having been born and raised a Muslim and having left the faith to become a Christian make him neither more nor less qualified to become president of the United States. But if he was born and raised a Muslim and is now hiding that fact, this points to a major deceit, a fundamental misrepresentation about himself that has profound implications about his character and his suitability as president. Apr. 29, 2008 update: This article builds on two prior ones on the matter of Barack Obama and Islam. First, "Was Barack Obama a Muslim?" considered the implications of his Muslim childhood; second, "Confirmed: Barack Obama Practiced Islam" responded to a critique of the first article. This third one brings the evidence together in a single place. Related Topics: Muslims in the United States, Southeast Asia, US politics | Daniel Pipes receive the latest by email: subscribe to the free mef mailing list This text may be reposted or forwarded so long as it is presented as an integral whole with complete and accurate information provided about its author, date, place of publication, and original URL.